Dutch Harbor, ALASKA (CNN) -- In Dutch Harbor the smell of fish wafting from the docks and the canneries is the smell of money. And lately, the town has smelled a lot less fishy. 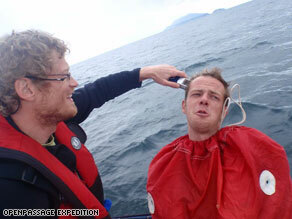 High seas high jinx: Tobias gives his shipmate Hanns a haircut at sea using a sail bag as a barber cape. Over fishing, new quota systems and changes in expected weather patterns have all played a role in changing the face of this once swashbuckling Alaskan town, fishermen say. "Last summer we thought that pollock fishing was over for good, it was so bad. Time to turn out the lights and go home. But then they cut the quotas by 30 percent and now there are some small signs of more small fish, so maybe they are coming back," said Guy Collins, who coordinates with fishing captains who unload their catch at the Unisea docks in Dutch Harbor. "The fishermen have to go further north toward Russia now to get the fish that are near the ice. It used to be the boats would go out 100 miles, now they go out 500. It could be partly due to temperature change and weather patterns." Dutch Harbor saw a revival in popularity with the reality show The Deadliest Catch, but even the high-fiving enthusiasm of the deck hands on the TV show can't match what the town was like in the glory days. "Those were the days, in the mid 1980's, there was booze, drugs and partying. You had lines of coke going down the bar and no one said anything," says Byron Singley, captain of the 24-ton fishing boat the Nancy Allen. "People were making big money and spending it as fast as it came in. I earned $78,000 as a deckhand the first year I was here but I can't remember where it went. Those days are long gone." Aboard the Silent Sound, as we sail north through the Bering Sea, we're finding other things are not quite like they used to be. For starters, we've been becalmed for much of the trip when we were expecting to encounter strong winds on the Gulf of Alaska and Bering Sea. We have motored nearly half of our 2,300 miles so far. More importantly, the ice we were bracing ourselves for may not be where we expected to find it. While this is good news for the expedition from a sailing perspective, it's less attractive for wildlife such as polar bears, seals and walruses that use the ice as a platform for hunting, mating and migration. "The present extent of northern sea ice is very similar to the extents at this time in 2008 and in 2007. It is close to values seen also in 1995 and 1990. It is about five per cent below the long-term average of 12.2m square kilometers," said Dr Humfrey Melling, a research scientist with the Institute of Ocean Sciences near Victoria, British Columbia. September 2007 was the first time that the Northwest Passage was open water from end to end. An ice forecast issued by the Canadian Ice Service on July 1 showed earlier than normal break up in many key areas in the Western Arctic. "In the Western Arctic region, the breakup pattern is one to three weeks early in many coastal areas and by as much as one month in isolated areas," the report said. But we're still some 400 miles from the Arctic Circle and a month from entering the heart of the Northwest Passage, which gives the Arctic plenty of time to surprise us.